In the last few months, I posted several video interviews with authors (e.g., interviews with Todd Burpo, Guy Kawasaki, and Scott Schwertly). Personally, I think this is more interesting for my readers than simply reading a written review. Both have their place, but a video interview provides a unique perspective on the book from the author’s vantage point. Initially, I had a difficult time getting used to the lower production quality. These kinds of video interviews are no rival for professionally produced ones. But I think it actually works in this case and adds to the credibility of the author and the message. Rather than answer these queries individually, I thought I’d write a post on it. While you might not have access to book authors, but you might have access to others that would be of interest to your readers. 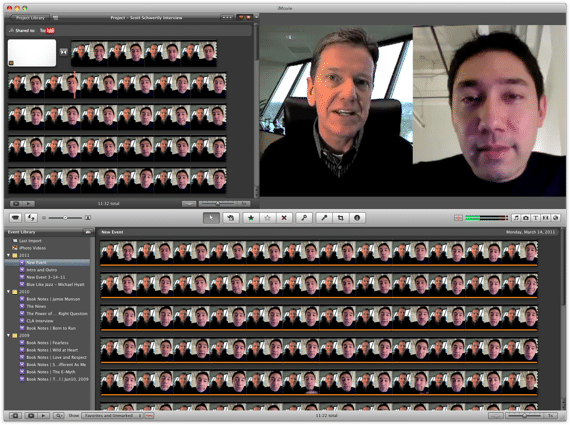 For me, video interviews are super easy to do. I can record the video, do the editing, and write the post in an hour or less (not including the time I spend reading the book and writing the questions). It is a very efficient use of my time. Schedule the video interview. I ask the author to block 30 minutes for the call. (If everything is working on both ends, we should be done in 15 minutes.) I confirm that they have Skype installed and ask for their Skype username. I then put the call on my calendar and include their Skype username in the notes. Prepare for the interview. Since I am interviewing authors, this means reading their book. I highlight and mark it as I go. Then, when I’m done, I type out a list of 5–7 questions. I then display these questions in a text editor directly under my webcam. Send the questions to the author. Some authors prefer to respond live, without preparation. (This is actually my preference when I am interviewed.) Others want to prepare. Regardless, I send the questions with a page reference for the answer next to each question. I want the author to know what I am referencing. I also confirm the call time. Record the video interview. 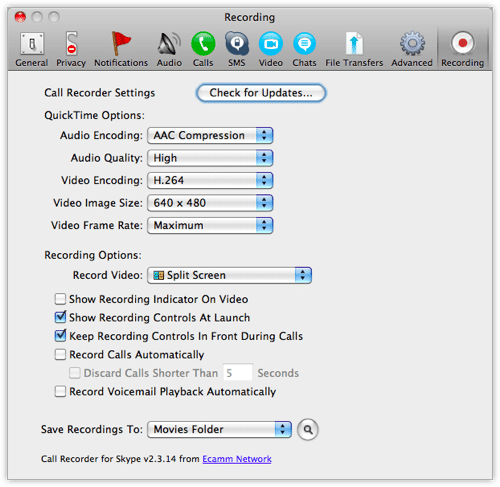 Make sure you are both ready, and then click the record button on Call Recorder. Try to look into the webcam as much as possible, though you’ll be tempted to look at the image of the person you are interviewing. When you are finished, turn the recorder off. The call will be saved in the folder you designated under your preference settings. Edit the video with your favorite editor. You can use something as simple as QuickTime Pro. I use iMovie. I generally don’t edit anything within the body of the video itself. I simply trim off the beginning (when we are getting setup) and the end. I also insert a video intro and outro at the beginning and the end. I had these professionally created by Duarte Design. I use a simple cross-fade transition between each element. Embed a link to the video into your blog. This will vary, depending on your blogging platform and the software you use to access it. I do mine with a code from within MarsEdit, my blogging software. I have the embed code mapped to a single keystroke. I also write a brief post around the video, introducing it, and including the questions I asked the author. I find that this helps draw people into the video itself. In addition to this, I send a “preview link” of the post to the author before I go live with it. (I do this with WordPress using a plugin called Public Post Preview. This enables me to give a link to them for public preview of a post before it is published. All in all, this is pretty straight-forward process. It creates some variety in my content delivery and gives my readers a perspective they might not otherwise get. Question: What additional questions or comments do you have about this process? You can leave a comment by clicking here.